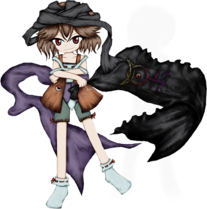 Suzumi Kuzu (國主　雀巳) is a human from the Outside World, and the main antagonist of Brilliant Pagoda or Haze Castle, also eventually a recurring character of the Len'en Project. Acting as an undercover informant for both Devanagara and the Dragonfly Castle, they are responsible for Mugenri spiraling into war games. They are known to have been seriously plaguing Yabusame Houlen and Tsubakura Enraku in the past; in particular, they're plotting Tsubakura's destruction, but their motive behind this remains unknown. Suzumi originally appeared as a hidden stage 3:0 boss in the demo version of Brilliant Pagoda or Haze Castle with little understanding to them. 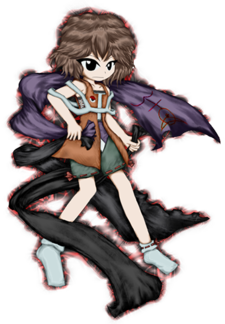 Later however in the final version, they were revealed as the hidden final boss on stage 6:0 and the game's main antagonist in the Extra+α stage. Eventually in v1.20, the game was updated to have them as a secret playable character of the game. Finally as of version 1.10a, Suzumi was retroactively added as a secret playable character in the past three games Evanescent Existence, Earthen Miraculous Sword and Reactivate Majestical Imperial. What's interesting about this is that Suzumi was originally a mysterious character who eventually became a prominent character of the series. Suzumi is a mysterious person originally from the Outside World. How they entered Mugenri is unknown; some of the Shitodo siblings remember them being present along with the rest of the group when they first arrived, but Suzumi's memory-altering powers make it difficult to know whether or not that's really what happened. In the past, Suzumi knew Yabusame Houlen and Tsubakura Enraku and allegedly attempted to fool and kill them. They work as an informant in Mugenri, working behind the scenes and giving information to key players in various incidents. Suzumi has a split personality. Cine Hamal, their blue-eyed personality, shows them to be carefree, mischievous, and overly campy. They talk and dress in a very effeminate way and enjoy getting on people's nerves. But to those who know them better, they are described as a cunning, troublesome individual. They like to tease the opponent with a smiling face and make fun of others, while simultaneously having an obsession with killing people. The second personality, Arde, is depicted as more level-headed and straight to the point, not hesitating to use far rougher dialogue and get quicker to the point. They seem focused on their main goal of collecting as much information as possible, though they show a more theatrical side of themselves in the extra+α stage, gloating victoriously before tricking the protagonists with their power once more. There is an unknown third personality, called "Benny". That is not the true name of the personality, and they have not yet made any appearances in the Len'en Project. Suzumi is the one responsible for the events of Brilliant Pagoda or Haze Castle, by spreading rumors to cause an incident with the intention of luring Tsubakura. By the end, they admit that they crafted such a complicated plan gambit to make things more fun for themselves. Suzumi talks to themself a lot as shown in the Secret Team's scenario, which are these two personalities. Only one personality can seemingly take over Suzumi's body at one time. Without these personalities, Suzumi is shown expressionless. Notably, the Arde personality is frequently exasperated with the Cine Hamal personality due to their brash actions and lack of self-control, with Arde repeatedly stopping Cine Hamal from callously murdering anyone that they shoot down; they also have their own thoughts on how to take care of killing Tsubakura, as Cine Hamal has a long, convoluted plan centered around breaking Tsubakura's spirit, while Arde simply wants to kill Tsubakura and get it over with. Upon listening to Cine Hamal's method, Arde dismisses them as "beyond fucked". According to JynX, Suzumi had their abilities prior to arriving to Mugenri, whether this applies to all their abilities is unknown. Suzumi has the ability to reproduce information, which allows them to create illusions by way of manipulating peoples' consciousnesses and altering what they perceive. In their attacks, they create danmaku out of nowhere and can also make the bullets disappear and reappear at will. Suzumi can create books containing the memories and experiences of a person upon fulfilling unspecified conditions. These books allow them to replay and/or overwrite a person's memory. They can replay a target's memory by reading a book containing their memories, and can overwrite them by editing the book and showing it to their target, knocking the target out in the process. Suzumi can also read books containing their own memories in order to fly back in time and alter the events of the past. Should a book be destroyed, they can easily regenerate it. One of the applications of their ability is what they refer to as "Overwrite", the ability to rewrite people's memories. However, such application has a weakness; overwriting memories of an event does not mean that the event never occurred, and people can therefore remember what has been erased under specific conditions. Memories can even leak through from other timelines. Hamee used this to make Hooaka "forget" their arm, essentially severing it, and, it seems to be their specialty. Another application of their ability is what they refer to as "Trace", which Arde describes as the ability to rewrite facts themselves. They also use it to "rewind history", presumably reversing time to gather information from the future safely before returning to the past. However, as with Overwrite, some people may be able to recall memories from before these rewinds, which Arde refers to as "Déjà vu", making careful use essential; Arde notes that killing people and rewinding to reverse it is particularly risky in this way. Suzumi can perfectly disguise themself as someone else as long as they know what they look like, as demonstrated when they disguised themself as Tsurubami Senri in the Extra+α stage. These disguises are so convincing as to be nearly impossible to see through (although Tenkai Zuifeng sees through their Tsurubami disguise). In addition to copying a person's appearance, they can also use that person's abilities, but are unable to master them. Suzumi has numerous other abilities besides their primary ability, to such a degree that no one can remember exactly what they are. Their full name is Suzumi Kuzu (國主　雀巳). Their first name "Suzumi" (雀巳) is composed of the kanji "雀", which means "sparrow", and "巳", which means "snake" (often used for the snake in the Twelve Earthly Branches). The first kanji ku (國) in their surname "Kuzu" translates to "country" while the second kanji zu (主) translates to "lord". Because of the bird reference in their name, Suzumi is a bearer of a Bird's Name. Their first personality (the one shown during stage 6) is named Monad 2 (モナド2), and referred to as Cine Hamal (シネ＝ハマル) or Hamee (ハミィ) for short by the other personality. There is a third, unknown personality nicknamed Benny (ベニー); their true name is currently unknown. Suzumi has neck-length brown hair and eyes varying between the colors, being one of the few characters whose eye color does not match with their hair's. The eyes change colour depending on the personality represented: blue for Hamee, red for Ardey, and black for a third personality (possibly Benny). They wear a white wrapping with black edges around their chest and triangular purple plus white cloth around their waist, all under an unbuttoned brown tank top style jacket. There is also a white strip going around their shoulders and elbows. For leggings and footwear, they wear a pair of green shorts with a red ribbon threaded through and tied off in a knot, and white socks with the same style of threaded-through ribbon. Additionally, they have three cloths they're always holding or wearing. One thin and long black cloth, one large black cloth, and one purple cloth. The long black cloth is almost always wrapped around their head, resembling a turban or kerchief. The large black cloth and purple cloth are occasionally worn together as capelets, with the purple cloth on top. Otherwise, they're just held by Suzumi. Hamee also wears a white choker with vertical black stripes on it. Suzumi has two symbols on their clothing which change positions. An eye accessory similar to the Eye of Senri, albeit with different colors, and a Monas Hieroglyphica. The eye symbol is used to pin the cloths together when they are used as a capelet, and is pinned to their jacket when they aren't. The Monas Hieroglyphica represents their power and glows when their abilities are used. There is also a smaller white Monas on their jacket. When disguised as Tsurubami Senri, their appearance was almost identical to the real Tsurubami, such as the hair, the white dress with ofuda scripts, the hat, etc. Suzumi as Cine Hamal, or "Hamee". Suzumi is the primary antagonist of Brilliant Pagoda or Haze Castle. They appear as the hidden final boss on Stage 6:0, as well as the Extra+α Boss. To unlock them as the final boss, the player will need to defeat all other possible final bosses (Chouki, Clause, Yabusame, Yaorochi, Shion, Tsubakura, Tenkai and Mitori). To unlock Extra+α, the player will need to beat all 3 Extra Stage bosses; Xeno a, Haiji Senri, and Yago Ametsukana. Afterwards, the player must re-beat Xeno a in the neutral route to proceed to Extra+α. They'll first appear disguised as Tsurubami Senri and use 6 spell cards. After the fight, they'll reveal their true self. They will then fight with an additional set of 7 spell cards. Suzumi entered Mugenri using an undisclosed method, where they gained the ability to reproduce and alter information. Though working as an undercover informant for the Capital City, Suzumi actually has ulterior motives and plans to use their new abilities to ruin Tsubakura's life. They are first referenced during the prologue, implied to have been involved in a fight with the Shitodo siblings that resulted in Hooaka Shitodo's right arm being cut off, asking them to spread to Tsubakura the rumor that they forged. When the heroes encounter Suzumi, they greet them casually and gleefully reveal their motives. Tsubakura and Yabusame are not pleased to see them, since they've tried to kill them in the past. Tenkai is worried about how the Capital City has been quickly modernizing and the subsequent war, to which Suzumi reveals they're the one responsible for the rumors in order to lure Tsubakura. Fumikado and their lackeys recognize Suzumi as an undercover informant from the Capital City, but they realize that Suzumi has an ominous and unsettling aura. Kuroji and their siblings are also not pleased to see them, and Suzumi reveals that they want to ruin Tsubakura's life in order to see them suffer as much as they did on the day their mother died. After Suzumi is defeated, they use one of their books to overwrite the memories of the heroes, setting in motion the events of the Extra stage. After the heroes complete the Extra stage, they're greeted by Tsurubami Senri, who had returned from the Outside World. The outsider humans fill Tsurubami with questions about how to return back to their world, while the Mugenri residents are confused about why the priest would return so soon. Tenkai immediately notices the farce and after a fight, they discover it was Suzumi impersonating Tsurubami. Suzumi is notably excited about tricking the heroes and reveals that they have been fiddling with the heroes's heads since the beginning by altering their memories. After another fight, Suzumi is again defeated. Despite the heroes taking countermeasures to prevent Suzumi from rewriting their memories again, they do so anyway and escape punishment, with Tsubakura being the only person to figure out that Suzumi is responsible. As of version 1.20b, Suzumi was added as a playable character. Rather than being in a team, it's just themself, with the same shot-type, bomb and flash bomb. The team is instead shown as Suzumi's personalities (portaits from the hidden Final Boss and Extra+α), and an expressionless Suzumi with pitch-black eyes. To unlock them, the player has to complete Extra+α with all other four teams. Their scenario works by: taking a route, collecting information, reverting back in time, repeat. By the time they are satisfied with collecting enough information, they encounter a clone of themself that was created through time travelling, who rebels against them and tries to kill them. In the demo version of the game, Suzumi instead appeared as a secret stage 3 boss. Suzumi's initial appearance here gave them a vague backstory. They will only appear on stage 3:0 if all other bosses on each route have been defeated. They will appear randomly on any end cell, regardless of the path taken. As of version 1.10a, Suzumi was retroactively added as a secret playable character in these past three games: Evanescent Existence, Earthen Miraculous Sword and Reactivate Majestical Imperial. Suzumi uses their abilities to travel back to periods of events of the first two games, taking place chronologically after Brilliant Pagoda or Haze Castle. Reactivate Majestical Imperial, however, takes place chronologically before BPoHC. Much like their own route in the fourth game, Suzumi collects information from those incidents for future usage. Notably, only Hamee appears in the scenarios of the first two games, as Ardey's abilities are incapable of travelling back to the memories of the past, but Hamee does occasionally make mention of Ardey's opinions on the world of Mugenri. A solid point to Hamee travelling back in time is that in Eastern Miraculous Sword, Suzumi mentioned to Sukune Katano the coming war in BPoHC and that Sukune is much stronger during then. Arde is present in Reactivate Majestical Imperial, as the scenario takes place before the events of Brilliant Pagoda or Haze Castle. In Evanescence Existence, Hamee's main goal was to find the real Tsubakura (but also to collect information). They were travelling through the airspaces by accessing memories of those present, swearing to kill all that they've met on their way there but were either too tired or too uninterested. Hamee realized at once that the "Tsubakura" on Stage 3 was a fake, and so tried to further make Tsurubami Senri tell the true reason as to why they spirited away outsiders to Mugenri, but failed because spell card rules don't apply outside it during the Extra stage. In Earthen Miraculous Sword, Hamee's goal was to collect information and have their own memories of the incident. During its entirety, they hung around Mugenri whilst complaining about various things. They also didn't kill anybody during their travel as Ardey would've been disappointed. They made references to the war during it and had interesting remarks to Hibaru Kokutenshi and Adagumo no Saragimaru. Reactivate Majestical Imperial is Suzumi's first chronological appearance in the Len'en Project. During it, Ardey and Hamee "solved" the incident whilst collecting information and checking on key figures. Benny also appears for the first time during the ending, being the commander of both as they went on with their plan for Brilliant Pagoda or Haze Castle. Suzumi has an unhealthy obsession with Tsubakura and sarcastically gives them compliments such as "Master Tsubakura" and "The greatest prodigy in all of history", teasing and threatening them all the while. In the past, while they were in the outside world Suzumi had tried to kill Tsubakura several times, endangering Yabusame in the process. In return, Tsubakura is afraid of Suzumi's sadistic tendencies and campy personality. Also, Suzumi is overly delighted by tormenting them and wants to use their newfound powers to ruin Tsubakura's life, in order to make them despair as much as they did on the day their mother died. Yabusame does not like Suzumi, since they have been at the receiving end of their sadistic mind games due to Yabusame being best friends with Tsubakura and Suzumi's obsession with the latter. Kuroji, Hooaka and Aoji also dislike Suzumi and prefer to stay uninvolved in Suzumi's sadistic mind games. On the other side, Suzumi wants to kill them, believing that Tsubakura's life will be a little ruined if the Shitodos die. Suzumi informed Fumikado in advance of the hole that would later appear in Mugenri's barrier, which became a key factor in Fumikado's revival plan and led to the events of Reactivate Majestical Imperial. Fumikado calls them "the undercover informant from the capital". It is implied that there might be a relationship between Suzumi and Tsurubami. Suzumi was able to disguise as Tsurubami during Brilliant Pagoda or Haze Castle, with the disguise being near-perfect to the extent that Suzumi could use Tsurubami's ability temporarily, but not master it. However, when Suzumi travelled through past memories to meet Tsurubami during Evanescent Existence, Tsurubami had no clue who they were. Suzumi disguised as Tsurubami Senri in BPoHC. Counting the Tsurubami disguise, Suzumi has the most spell cards for an Extra stage boss, having up to 13 total. There's a barely visible human shaped shadow in Suzumi's EX portrait in Brilliant Pagoda or Haze Castle. Suzumi is the only character in Brilliant Pagoda or Haze Castle to not appear as a possible midboss in the Extra Stage, likely due to them appearing as the Extra+α boss later on. Suzumi's ability to rewrite the past is possibly the reason for Brilliant Pagoda or Haze Castle's "choose your own adventure"-style plot; JynX has stated that the events of the game's demo can also be considered canon as a result of their ability. When Suzumi was added to the past games, their portraits from Brilliant Pagoda or Haze Castle were re-used rather than having unique portraits. According to JynX, it is possible to defeat Suzumi in spite of their powers, albeit it is "extremely difficult". ↑ Was originally called トレース(記憶追従) in the dialogue mentioning it, but is displayed here in a modified form to stay consistent with Suzumi's spell-naming scheme. 2016/12/01 Brilliant Pagoda or Haze Castle - Official Profiles, Prologue, Possible Final Boss, Extra+α Boss. ↑ 1.0 1.1 JynX Twitter: "By the way, there's another one named "Benny". The true name is a secret." This page was last edited on 29 March 2019, at 11:15.